I have had my head in a world of costume and dwarves lately, so it may sound like I'm losing my grip on reality when I say that The One Ring, The Preciousssss, actually exists in the real world -- and it's not a film prop. This real world ring is a cursed (yes, really) Anglo-Romano ring from the 4th/5th century that was found in a field in 1785 in Silchester, Gloucestershire. It's a rather large inscribed gold ring, weighing 12g. And when I say large I mean "dude must have worn it on his thumb over his gloves" kind of large as it's 25mm in diameter. It has 10 facets, with the top centre facet engraved with a profile of Venus -- albeit a rather unattractive one. As the writing is reversed and the profile is quite recessed, I think it was probably a seal ring, however, there is nothing in any source article that officially states that it was. 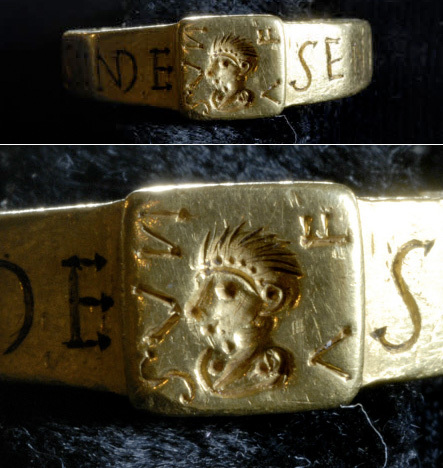 Above: The ring and a close up of the Venus head, sourced from The National Trust website. The ring inscription runs across the facets and reads "SE | NI | CIA | NE | VI | VA | S | II | NDE." Several sources interpret this as a shortened statement of monotheistic belief, seeing it as "Senicianus vivas in Deo" or "Senicianus lives in God". A 19th century source suggests that "Senicia ne vivas iinde" is more likely, with iinde being a truncated form of any one of the many words that start with "indec"-- most of which bear the connotations of dishonour. This would translate to "Senicia does not live indecently", which would explain the presence of the Venus head as a representation of chastity and honour. Either translation would be a nice counterpoint to the curse placed on the ring though. 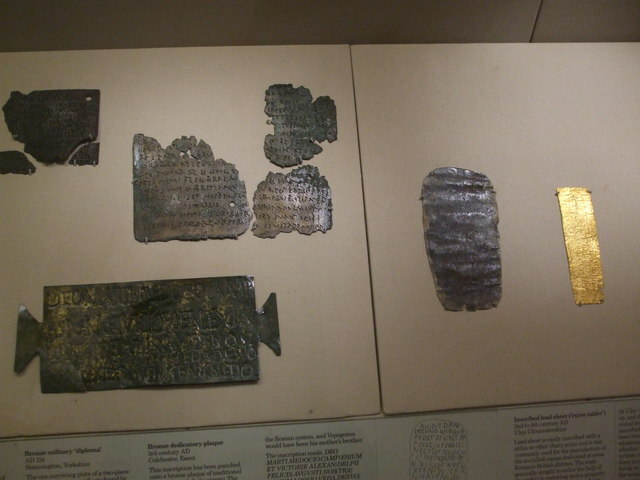 Roman curse tablets from the British Museum. These were usually left in places in closer contact with the underworld, such as baths, springs, graves and temples. 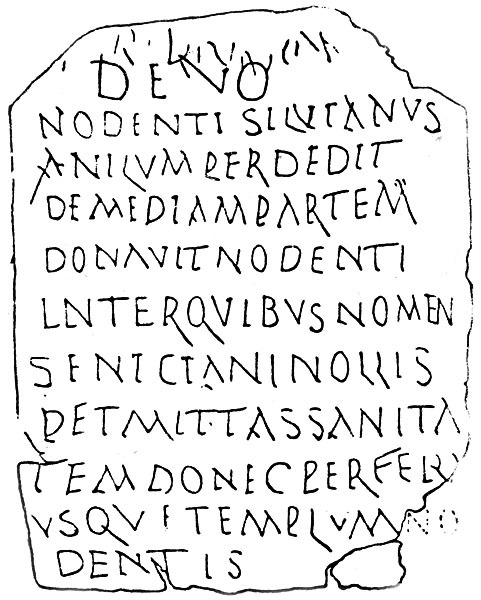 Translation: "To the god Nodens: Silvianus has lost his ring and given half (its value) to Nodens. Among those who are called Senicianus do not allow health until he brings it to the temple of Nodens." (Source: CSAD at Oxford). Now sure, the two items weren't found too close together, apart from being in the same part of the country. 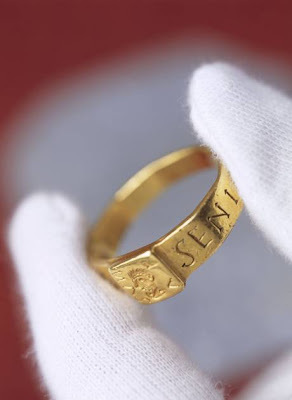 But that ring is pretty distinctive and Senicianus was not a common name at all. Many of these curse tablets specifically cursed people for theft, although this tablet never uses the word. The word "lost" is interesting -- and why only half it's worth? Of course we'll never actually know that answer. 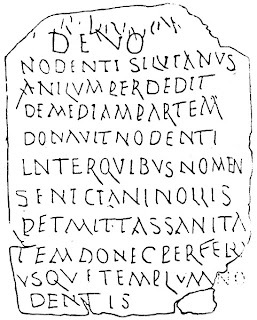 Obviously, Senicianus never brought the ring to the temple; instead, he put his name on it with the message of "I didn't steal it". After all, he does not live indecently. As far as I can see it, this is basically Latin for "Neener neener". There's a story there and I wish I knew it. It's a very human, very petty story, but it would be an insight to the lives of these people. So where's the Tolkien tie in? In 1929, when Sir Mortimer Wheeler was working on the temple excavation, he realised the link between to the curse tablet and the ring and asked Tolkien to work on the etymology of the name "Nodens". Tolkien visited the temple several times that year. Of course it's just coincidence that the Iron Age mine fort "Dwarf's Hill" is just next door... And that he started writing The Hobbit the next year. Sure, we don't know for sure, really, but... just sayin'. Seriously though. How big were this guy's fingers? Either way, The National Trust is taking full advantage of The Hobbit publicity and has put the ring on display from 2nd April, 2013 at The Vyne in Basingstoke with all the Tolkien tie-ins ever. The ring sits in a special rotating case in it's own room, along with a magnifying glass and a copy of the curse tablet and first edition signed Tolkien works. The Vyne has also created a Middle Earth adventure garden for the kids -- though I can see that I'd have to have a go in there. Seriously, whoever made this happen is a marketing genius because I'd love to go see it. Next time I'm dahn saff, I may have to. Get the games crack files, hardware files, computer applications, mobile apps and much more in www.krazy99.com just $0.99 cent. Recovering Starbucks addict, self-confessed geek.